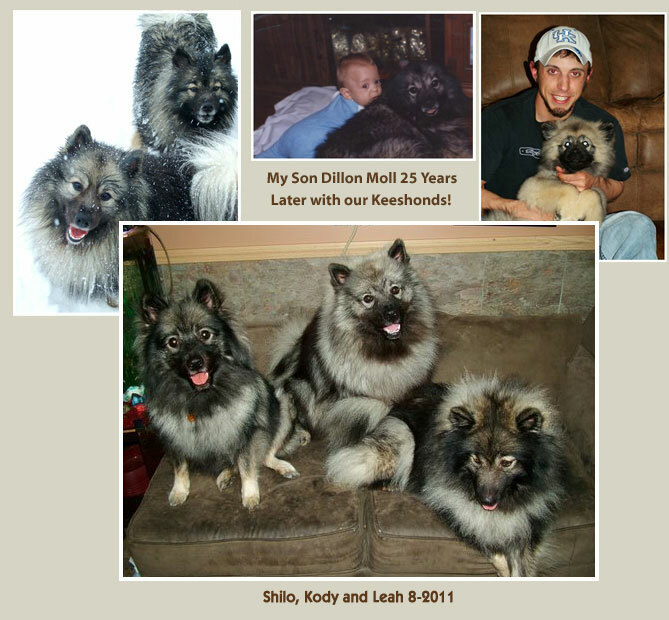 ﻿ I first got hooked on the Keeshond breed when I was 14 and living on a farm. My father brought home a 4 year old male Keeshond from a rescue and I fell in love instantly. I named him Smokey, and he quickly became my best friend. Smokey went everywhere with me.... even when horseback riding for miles, he never left my side. When I learned to hunt (yes, girls do hunt! ), he would follow me in the woods and sit with me until the deer would come and then proceed to chase them away. Needless to say, he learned he could not go hunting with me anymore if we wanted to eat deer meat. At 19, I got married and wanted to start raising Keeshonds. 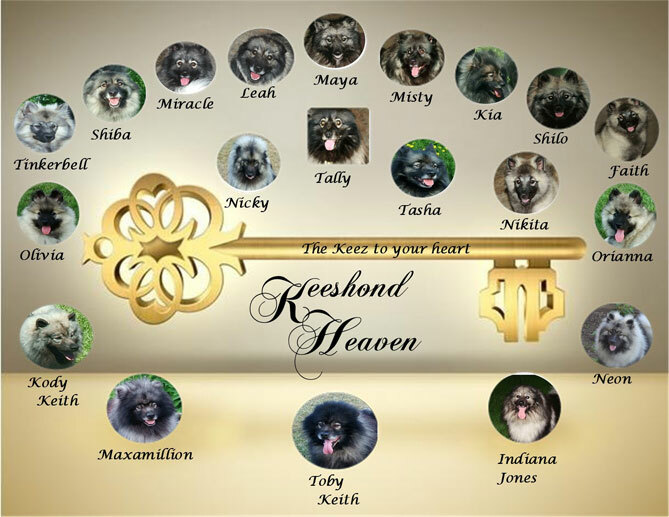 It took me 2 years to find my second Keeshond. I had bought her from a lady named Mrs. John Craley. She was in her 70s and taught me everything there was to raising this breed. By 24, I had 15 adult Keeshonds and 2 children. When the children were born, I discovered that this was the perfect breed of dog to raise a family with. My Keeshonds loved the kids and were very gentle with them. I'm now in my 40s and have 18 adult Keeshonds. Some are currently retired and just enjoying life and some are busy breeding the cute, new puppies to make others smile! 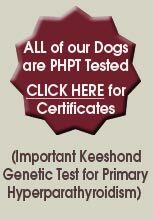 Select dogs are being raised to carry on our blood line. These dogs are therapy for any one who buys them, because you can’t help to feel so good around them. My Keeshonds are part of my family and they know it! We have a 28’ x 40’ part of our home that is just for them....central air, music and lots of toys! We live on 5+ acres of land with a stream and pond. They love water and love to swim at an early age. My dogs are free to run when ever they want. Everyone has doggie doors to come in and out when ever they please. Most of the time if I'm in, they are in...and if I'm out, they are out. A curious Keeshond can never not know what your doing, It's their job! 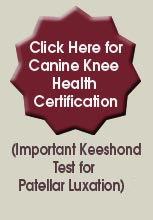 ﻿It's important to me that my Keeshonds and their pups are cared for in a loving and nurturing environment. This addition to my home has been a lifelong dream to build, and it was worth it! 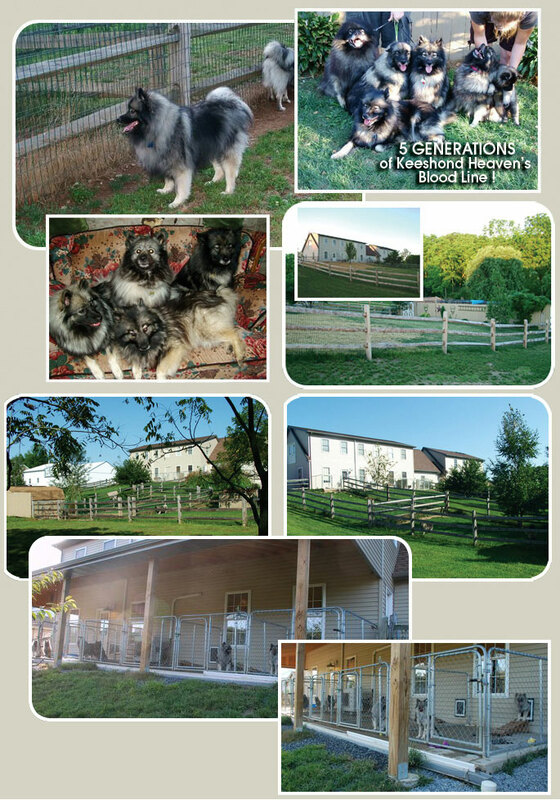 All the Keeshonds love it here and have fun playing and lying around listening to music or playing with their favorite dog toys.